I absolutely loved the class and it was right near my work!!! But the only thing is I’m kindof upset I can’t get the “first customer” deal now because of nift. So now I only have 1 more class vs 2 more weeks they typically offer. Doesn’t seem like a deal! The atmosphere was fun and the instructor was really good. Fun, challenging, upbeat and motivating way to get a great workout! It was a very challenging class! The instructor was motivating! Customer Service is good and they have facilities (shower, towels) so the overall experience was good and smooth but the fitness workout itself was a bit meh. But I don't have a ton of experience to base that off so I'll give it the benefit of doubt. Thanks! Loved the spin classes! Good music and atmosphere! I would definitely go back! I loved this spin class!! The instructor was awesome, the themed playlist was a lot of fun, and it was a challenging workout. I'll definitely be going back. I had no idea this studio existed so close to my home! Thanks! I've already told my husband about it, and he may check it out as well. Easy to use. Turnstyle staff were very nice! The staff was helpful and the cycling was so much fun! I went to a spin class at Turnstyle and absolutely loved it. It was super high energy and unlike any spin class I've gone to before. They were super friendly, the instructor was great, and it was an intense workout! The instructor was great very interactive and motivating. I enjoyed the themed playlists. Great experience, good location and friendly staff! Great workout, great music, friendly staff. So happy there are exercise options for Nift gifts. Love supporting local businesses. Turnstyle is a very welcoming studio with amazing instructors. Also super clean. Very helpful staff and a great class! Amazing studio! They're not pretentious or in your face, but it's an INTENSE workout. Good instructor, friendly and helpful staff. Really fun workout and such friendly staff! Turnstyle Cycle was awesome! I will almost certainly return (and pay) for future classes. Nift is an awesome concept, and I appreciate the opportunity to try a place I otherwise would not have known about. The class was amazing, I can’t wait to go back. i loved this place! So happy I was able to try it out! Turncycle studio is a great place with encouraging atmosphere and energetic vibe that help a new client to get through the first class. I absolutely love Turnstyle. It's such a great workout, motivationg atmosphere, and really made me sweat! The experience is like no other. Great studio - always inclusive to beginners and always a challenge. This nift got me into spinning! This was my first spinning class ever, and it was great! I really enjoyed the class, so much so I am looking into class packages to purchase. Loved using a Nift and Turnstyle was fabulous! I thought it was a good workout and seems affordable so I will probably be back, but the set up of the room was interesting. Fun class and really accommodating for first timer! The space is a little cramped, especially between classes when double the number of people are trying to utilize the studio space. Might be my first genuine cycling class yet! The music wasn’t too loud like other studios, can clearly hear the instructors, didnt feel rushed, and was kindly and thoroughly assisted on my bike by a worker! Most importantly while still having a blast! The music was on point so I was full of energy after class. Definitely recommend. Not a high end studio but the actual class is amazing. Very fun way to try something new. I love these little Nift surprises! The certificate was easy to use and the class was awesome! the staff is exceptional! the area outside of the workout room does not feel clean, but the workout area itself is great. However, I was not able to relate to the choreography (perhaps because I'm new to cycling classes as well) but bottom line is I got sweaty but the workout was not as intense as I would hope. And the workout quality is the main consideration for the rating. I was dead after the workout and sore for three days, but it was really worth it! I have been out of shape for a while and this was a good way to remind me that I should start again. The instructor was amazing and very energetic! Danielle at Turn style cycle led a great class! It was a great opportunity to get a workout in and avoid the cold whether outside. Thank you Nift! This was great! So much fun. Thanks for the ride! Fun workout class and I love the different themes!! I tried the TRX, and it was just alright. I think their main thing is cycling so i will have to try that. Was fun and a great work out! Wouldn't have ever gone/known about it unless I received this nift! Great studio, great instructors, great schedule. Love this place! Haven't actually gone yet, but so excited!! It was awesome! Thank you!! Great class, loved the music and the energy. 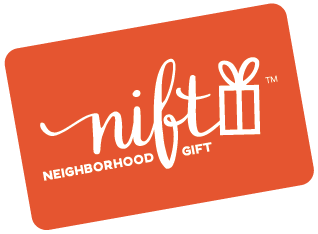 Nift is a great way to try new places and thing in the area. Love to spread the word and keep going back to the places i discover. TRX Bootcamp was easy to follow along with and small enough for lots of personal attention, but definitely challenging enough for a good strength session in a quick 45 minutes!